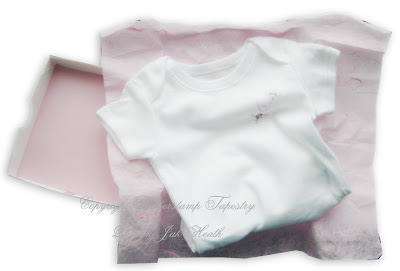 A special Baby gift box using Rubberstamp Tapestry Baby stamp set, all stamped using Versacolor ink cubes and the heart shapes are the Nestabilities hearts, this set is a must have. The box was made using 20 x 20cm sized card. 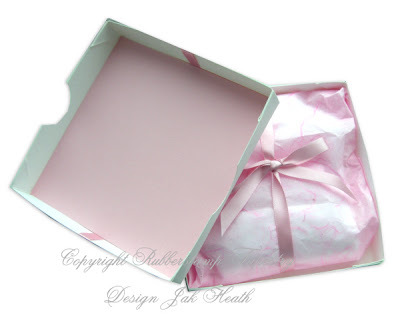 So now you have seen the special box you need to know what special gift is inside it. Stamped with versacolor ink then heat set with an iron. It is beautiful, the stamping on the box looks very delicate. Oh my gosh! Jak you have outdone yourself again!!! Just perfect. What a lovely idea and a lovely present, I never guessed that would be popping from the box. Lovely work and a lovely idea Jak..Someone is going to get a lovely surprise. This is a beautiful gift someone is going to be over the moon withit. Just a delight Jak. Love the gift and the box. Jak love the box and the gift oh so cute. This is absolutely delightful, Jak. I just love it. I have those stamps but haven't used them yet. You are a real inspiration. WOW WOW WOW Jak, that is absolutely gorgeous. I absolutely love it. Awww Jak that is sooooo cute. What a special gift for a new baby. This is absolutely beautiful. Can I asked how u used the inks to stamp the flowers considering it is so detailed/varied in colour? ie did u use a brush or something? 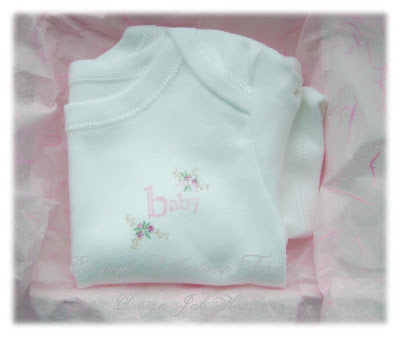 This is so lovely Jak any new Mum would be very pleased to recieve it.